Seeing Dominic Dromgoole’s swan-song production some time after its official opening, your reviewer can report that it can only be regarded as a bonus. After an official first night, players and production can settle into their stride and this production of one of Shakespeare’s `late’ plays (not apparently the last he wrote according to the programme) has a marvellous sense of flow and unruffled conviction missing sometimes from larger, more extravagant productions. 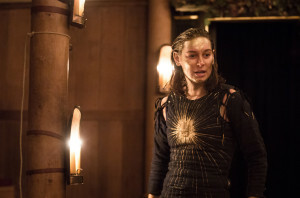 In fact, for a play that embraces a wide range of geographical and mythic situations – storms, a desert island, goddesses descending – the small, indoor candlelit Wanamaker fits perfectly endowing it with rare emotional intimacy. For all its craft and reputation, The Tempest, to this viewer, can often seem almost unstageable. With its fussy exiled court scenes, the middle scenes do drag. 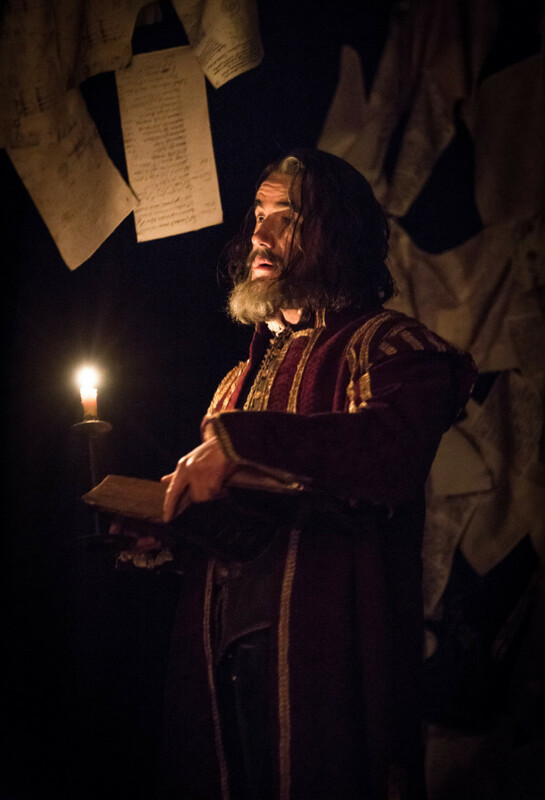 But Dromgoole has found a way to make this Tempest unusually affecting by virtue of the freshness of the delivery of the text lead by Tim McMullan’s deeply felt, wholly human but revengeful master-wizard Prospero. Dromgoole has often said that the secret to directing the Bard is to treat his work as new plays. And that is what he delivers here, for all that being the Globe, period costume prevails. In that McMullan, with his lank, whispy wig and doublet also resembles its author must also surely be deliberate. A heavy sense of melancholic introspection hangs over McMullan, reaching a kind of apogee in his farewell to his staff, his books, the island and we, the audience. Elsewhere, Dromgoole plays a straight bat to some of the play’s conventions. No questions are asked as to Miranda and Ferdinand’s future – both nice young things – as was apparent in Jeremy Herrin’s 2013 production. But Pippa Nixon’s female Ariel is interestingly ethereal and pinched, Fisayo Akinade’s Caliban more in need of protection than usual whilst the comic scenes work a treat with Dominic Rowan’s knowing, tall-hatted, music hall Trinculo making a fine foil for Trevor Fox’s drunken Stephano (who last time here played the opposite role). Never did Prospero’s climactic lines seem more movingly potent. All in all, a fitting triumphant farewell for the Globe’s outgoing director.